Five pages in to Chew on This, I was hooked. 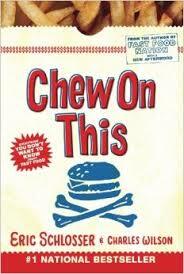 The book Chew on This by Eric Schlosser is a non fiction book all about how fast food eateries came to be. The book gives the reader fantastic information about how gross fast food is under all their solid profits. In the book it states that “fast food advertisements show happy, thin kids smiling when the cashier hands them their bag of grease, but the truth is most overweight kids eat at McDonald’s Burger King, Taco Bell, Pizza Hut and other recognizable fast food restaurants.” In the book it also tells how nothing is fresh. In fast food advertisements they say that their salads are made with only fresh ingredients. They also say that their burgers are made from premium cuts of beef. They lie the customers in the advertisements. Chew on This is a nonfiction book. However, it does, have eye openers. One eye opener that got my attention was how they treat their workers. Most of the employees work seven hour shifts a day seven days a week and only get a twenty minute lunch break every day, while the owner/manager is outside every twenty minute for a smoke break. The author used convincing word choices to describe how unhealthy fast food restaurants eateries are for you. If you enjoy nonfiction books that tell the truth I would strongly recommend this to you.